I’ve made a few improv projects over the years. Do you have a lot of scraps you don’t know what to do with? Here is how you can use them. 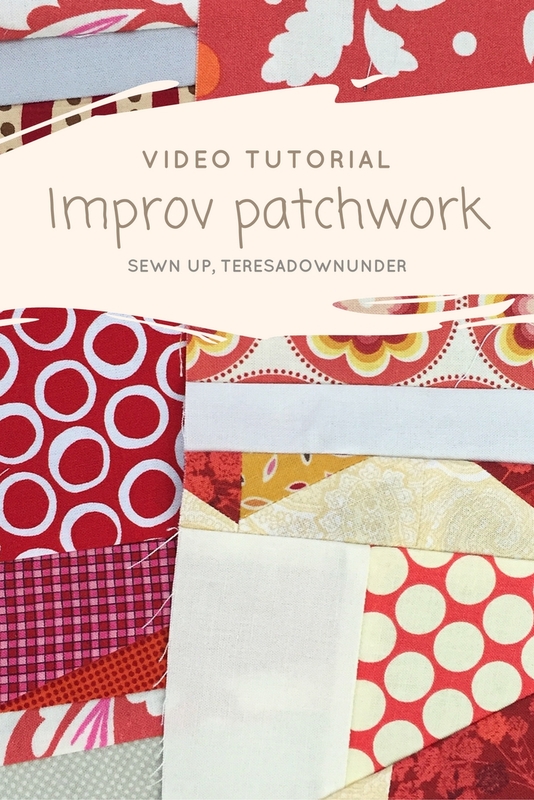 This is is just one way to do improv patchwork but quite an easy one. You can use a piece of paper as stabiliser or nothing at all. Improv paper piecing template (pdf). If you like improv patchwork, check out the projects I’ve made over the years. If you enjoy my tutorials consider subscribing to my Youtube channel. I love improv patchwork and I hope you get to love it too after you try it out. In this third and last tutorial I will make an improv design for the back of the quilt using some left over fabrics from the top of my Père-Noël zigzag Christmas quilt top. 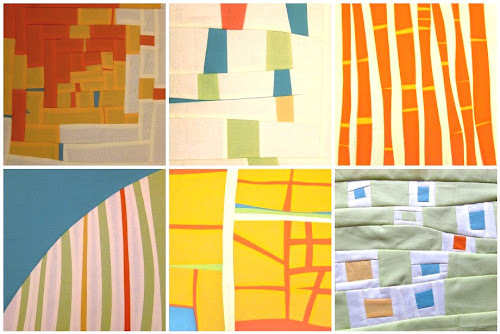 There are no patterns for this one, just a visual progression of the improv patchwork being put together. I used the charm squares trimmings and some matching reds, green and white solids. The patchwork is made by sewing the trimmings in between rectangles of solid colours. I started with the middle strip. The white rectangles are 2 1/2 in wide down but they decrease in width and end in a triangle. The most obvious way to achieve this is to cut a long strip 2 1/2 wide which ends in a pointy end. Then slice the strip into bits. The length of the strip depends on how long you want it to be. I wanted it to be almost as long as the quilt. This is what the strip looks like. After sewing the white strip I cut the trimmings again. And did the same with both red solids. Some of the trimmings had to be stitched together. To sew both strips together, place both strips side by side right side facing up. Overlap both edges well and then pin. Use the overlapping line to cut through the bottom strip. Now pin together well and sew. Do the same with each strip. I continued until I finished all trimmings more or less. This is the resulting improv patchwork that I will be the back of the zigzag Christmas quilt. Now you need to square the improv patchwork into a panel that will be making the back of the quilt. Use the same technique as before when sewing two pieces with uneven edges. Place the piece on top of a muslin or calico piece of fabric and pin. Then cut along the overlapping edge. Pin together and sew. Do the same for both edges. The back of the quilt is finished. Assemble the quilt sandwich and quilt. I used a variety of free motion quilting patterns for this quilt. The patterns follow the zig zag in the quilt. Trim off the quilt backing and batting. I have been machine binding my quilts lately. It takes a small fraction of time as compared to slip stitching them at the back and the finish is just as good in my opinion. To machine bind a quilt, you need to place the binding on the back of the quilt, aligned to the edge of the quilt, as opposed to stitching it to the front first. For small lap quilts I don’t use binding cut on the bias but just cut straight from across the grain of the fabric. To start, cut a strip about 225 in x 2 1/2 in. You’ll need to cut several strips and piece them together to obtain this length. Fold the strip in half and iron well. Take the quilt on the back and place the raw edge of the strip aligned with the quilt edge. Stitch all the way to the corner stopping at 1/4 in from the edge. Now fold the strip up in a 45 degree angle as per picture. Then fold the strip back aligning the fold with the top edge as per picture. Pin. Now stitch all the way to the end again, stopping at 1/4 from the corner and do the same again for the next corner. Once you have done the stitching your top will look like this. Now fold the strip back over the top of the quilt. The binding will cover the raw edge all the way to covering the stitching line. When you reach a corner, with your finger fold the mitred corner as per picture. First fold in a 90 degree angle the binding at the corner. And then fold back again as per picture making sure you align both corners. 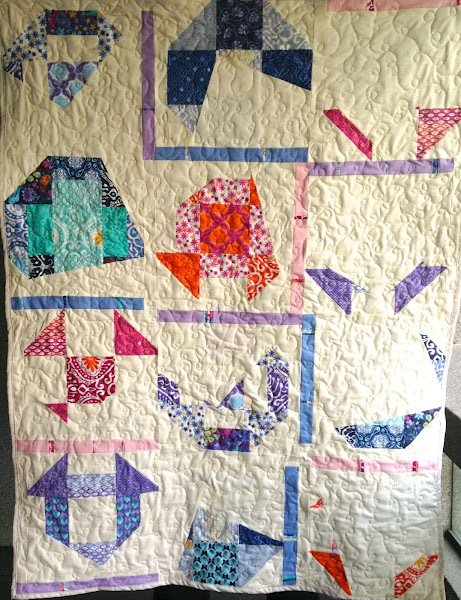 Pin the whole quilt binding this way. And now top stitch as close to the edge as possible. And this is the quilt, back and front. Time to put all blocks together with some sashing and a border. I made 4 strips of sashing, larger than required and then trimmed each strip as I added the sashing. Sashing is made of 2 inch cream strips with some touches of colour. Place the cream strip below the colour strip and make a cut like below. Pin well together and stitch. Then place the cream strip on top of the colour strip and cut along the line. Now put both coloured and cream strips together. Now do the same with another colour. Cut together to make sure that cutting lines match. The curvier the edge the more pins you will need to ensure the seam lies flat when stitched. Iron the sashing well before sewing to the blocks. Pin one strip to the top of one block and stitch. Stitch sashing to the next block. Continue adding strips and trimming. The border is 3 1/2 inches wide. Cut 5 x 4 inch squares and make a cut across each of them. 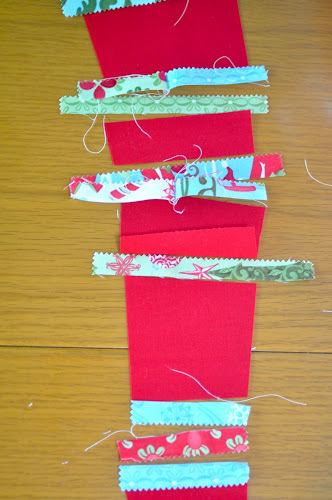 Cut now a narrow strip in a coloured fabric by placing the piece of fabric as per picture below. Cut along each line on the sides. Do the same for all squares. Trim to 3 1/2 inches. Place the squares around the border and sew to strips of fabric 3 1/2 wide. Stitch the border to the assembled blocks. Make a quilt sandwich. I used calico for the backing and cotton batting. Pin all three layers together. Quilt the sandwich. I stipple quilted it. My canvas is 90 x 70 cm (about 35.4 in x 27.5 in) and as you can see in the photo, the quilt is quite a bit larger so it wraps really well around the frame. Unfortunately some of the border stripes can’t be seen. Too late for me but you could make sure that in your border you add the little stripes closer to the blocks so they show. After carefully placing the quilt over the canvas making sure it is centred (my quilt wasn’t perfectly square so on some areas there is more border showing than in others), staple the quilt well all around the frame. Start stapling on opposite sides first. Then staple in between the existing staples. I was going to add some fabric border around the frame but I’m undecided. And now that it is finished, I am not sure it will work well as a bed head.